The temperature in Central Indiana was in the single digits last week and the windchill...well, let's just say it was stupid cold. To add insult to injury, our furnace broke on the coldest day we've had all Winter, followed by frozen water pipes. But, I am NOT complaining. Okay, I was complaining. But I shouldn't be complaining because I am currently in Key West and I am wearing my favorite monogrammed Switchflop sandals and I am eating shrimp. Tomorrow night I will be freezing in the Hoosier Heartland again. Today, however, I am all about sunshine and sandals and skirts made of sailcloth! 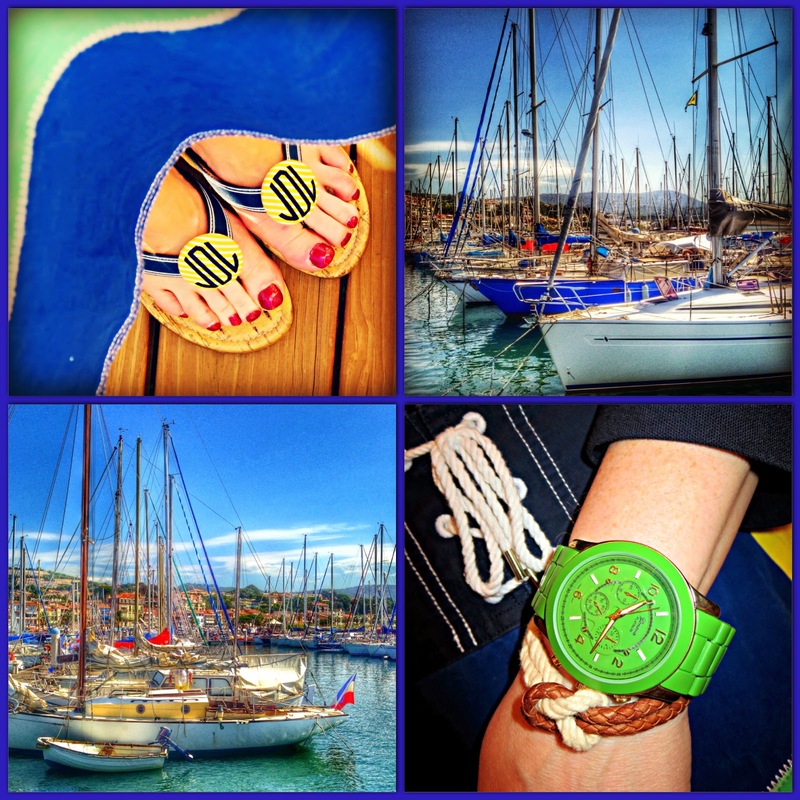 I took these harbor pictures in France last Summer; I added custom monograms buttons to my Switchflops (you can find similar ones here); the watch is Geneva (from Steinmart) and the leather and rope nautical bracelet is from Kiel James Patrick. The travel writer Tim Cahill said "A journey is best measured in friends rather than miles." So true. The very best part of this brief mid-Winter getaway is that we get to spend time with dear friends visiting the US from Germany. Though I can't say I'm disappointed they chose someplace warm! 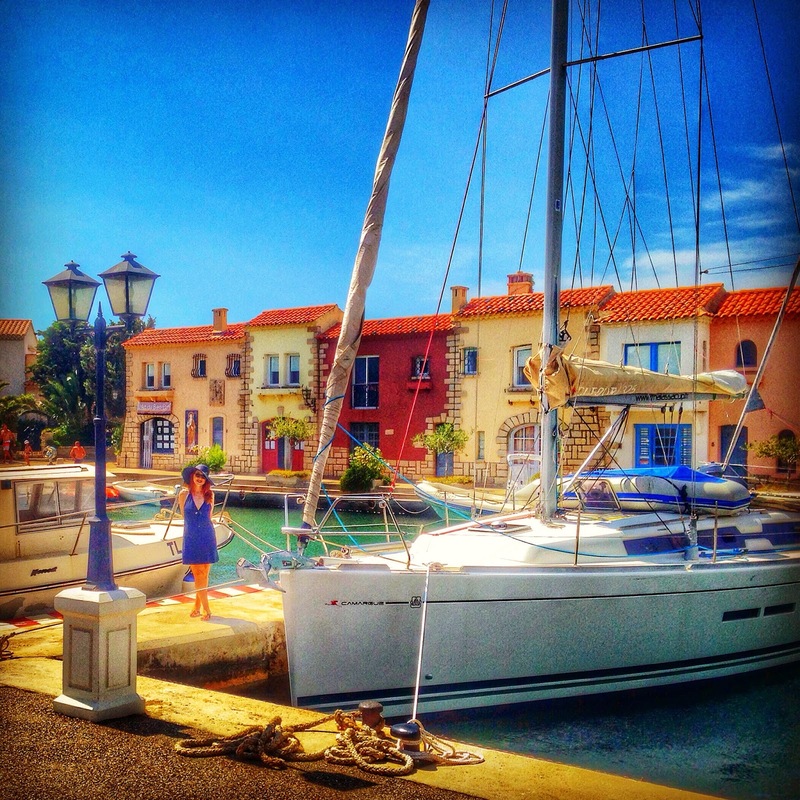 In fact, our German friends have impeccable taste in vacation destinations - we spent several days with them last Summer in the South of France, where I was also all about sunshine and sandals and swooning at sailboats. The harbor pictures above and below were actually taken in the French Riviera, and I'm reminded of those big, beautiful boats and that exquisite trip every time I wear this sailcloth skirt from American Living (and no, the irony of associating an "American Living" skirt with a French location is not lost on me). But now I'll associate it with a fun Winter getaway in Key West, too! It's hard to see in the picture, but my Switchflops were my go-to shoes in France last Summer, too. They are the best for travel because you can match every outfit without taking up space in your suitcase!